Barrington Wilshire As landscape architect, interior designer, and graphic designer for this upscale modern residential building in Brentwood, we were responsible for crafting its public spaces and other signature elements that would both maximize its views of Los Angeles and give this seven-story building a distinct identity and brand. We started at the top, carving a 2,000-sq.ft. patio out of the rooftop that allows residents to enjoy California outdoor living in myriad ways. The space includes a hot tub, an outdoor kitchen, and a fire pit with custom seating for large groups. The oversize communal table welcomes large gatherings, but can also be split apart into smaller tables for more intimate meals. Five-foot-high glass rails all the way around the roof preserve the outstanding views. 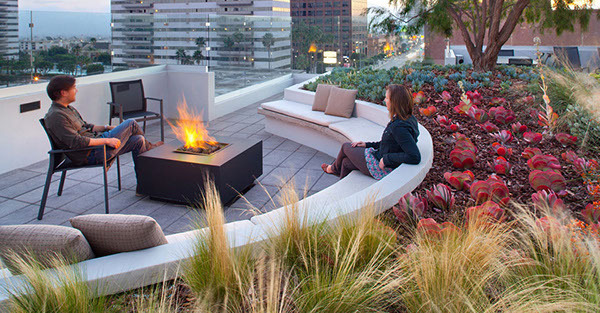 Drought-tolerant succulents and grasses divide the space so different groups may all enjoy the rooftop's amenities at the same time. The feather grasses wave softly in the ocean breezes, as do the willowy branches of the 15-foot-tall peppermint tree. The tree's leaves emit a fragrant peppermint smell when they fall to the ground. To unite the interior and exterior, we created a pattern of stenciled circles, based on an abstraction of the bw logo. The pattern adorns light boxes between each apartment's balcony, the ground floor windows, the way-finding systems in each hallway, and the apartment number signs. 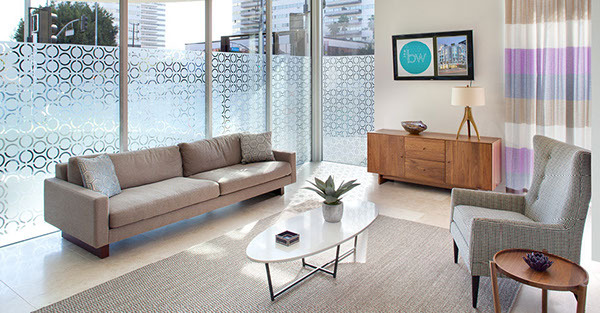 This is what we had: The BW is bringing a new sophisticated living concept to the Westside; modern residences available for lease with personal, at-your-door services and lease terms tailored for their residents. 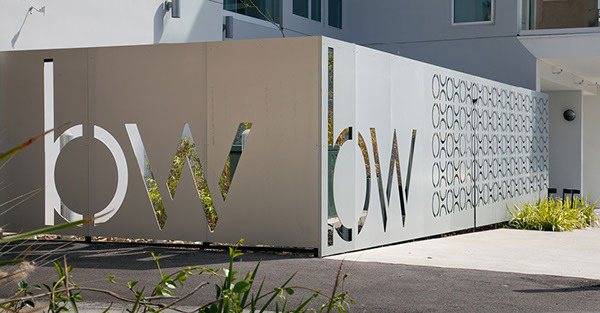 Rios Clementi Hale Studios designed the landscape and a roof top deck along with a simple iconic logo and pattern for the BW brand. Or “Rios Clementi Hale studios designed Landscape Architectural and Graphic Design services for a 5 story multi residential building with retail space along the ground floor. Design includes planting along the sidewalk, a sidewalk patio, courtyard planters and the level 4 exterior deck. In addition to our landscape architecture, we were tasked to develop an identity and brand that would define the project.” This is a bullet list provided by Tavi: Interior hallway design Signage and way finding Entry lobby Custom ‘bw’ graphic Custom exterior water jet cut screens/ light boxes 72” box tree Fire table Spa Outdoor kitchen and community dining table. This is what I wrote with some edits from maribeth: The BW is bringing a new sophisticated living concept to the Westside; modern residences available for lease with personal, at-your-door services and lease terms tailored for their residents. Rios Clementi Hale Studios was asked by California Landmark and the BW to provide interior design for the entry lobby, leasing office, and interior hallways, graphic design and landscape architecture for the 5 story multi-residential building in West Los Angeles. Our landscape design includes planting along the sidewalk, a sidewalk patio, courtyard planters, and the level 4 exterior roof deck. The design for the roof deck provides a place for residents to enjoy the experience of California outdoor living. We added a 72” tree box with California native drought tolerant plants, and a large Agonis flexousa or “Peppermint” tree to provide shade. Custom seating is scattered throughout the space including one area centered on an inviting fire table with a beautiful view of the city. 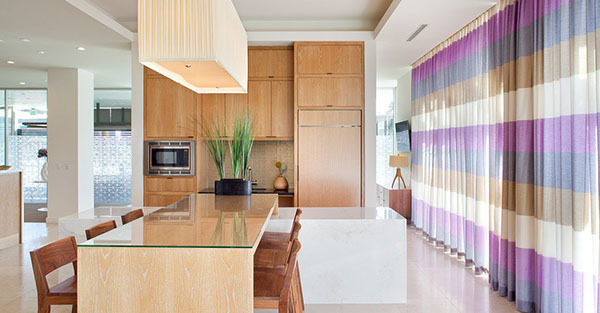 Nearby, an outdoor kitchen with a community dining table gives residents a place to gather and enjoy a meal. Lastly, the spa offers a spot to soak and relax after a hard day. In addition to the interior and landscape designs, we were tasked with developing an identity and brand that would define the project. We custom designed a simple iconic logo and pattern for the BW brand that was used throughout the building. 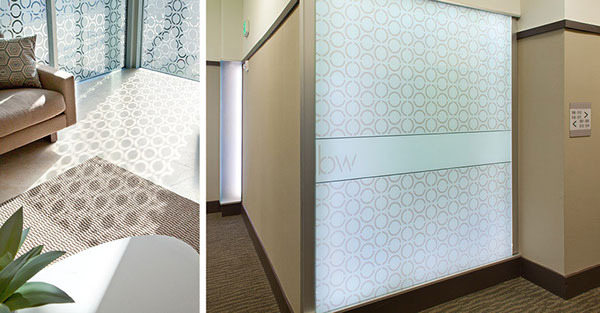 The design can be seen on the custom light boxes that line the interior hallways, on all the signage and way finding, the graphics along the windows, and in custom exterior water jet cut screens that light the outside of the building. Maribeth Draft: Rios Clementi Hale Studios was asked by California Landmark to provide interior design, graphic design and landscape architecture for a 5 story multi-residential building in Los Angeles. RCHS provided interior design for the entry lobby ,leasing office, and interior hallways. Our landscape design includes planting along the sidewalk, a sidewalk patio, courtyard planters and the level 4 exterior roof deck. 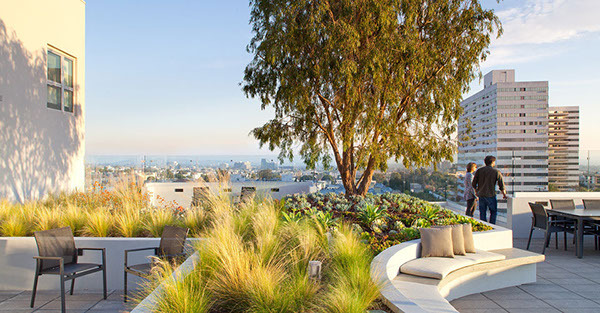 The roof deck provides (alternative: “On the roof deck we provided…”) a place for residents to enjoy the experience of California outdoor living in a myriad of ways. Shade is by provided by a large Agonis Flexousa or “Peppermint” tree which is situated in a 72” inch box and surrounded by California-native drought tolerant plants. Custom seating is scattered throughout the space including one area centered on an inviting fire table with a beautiful view of the city. Nearby, an outdoor kitchen with a community dining table gives residents a place to gather and enjoy a meal. Lastly, the spa offers a spot to soak and relax after a hard day. In addition to the interior and landscape designs, we were tasked with developing an identity and brand that would define the project. We designed a signature “bw” graphic that was used throughout the building. 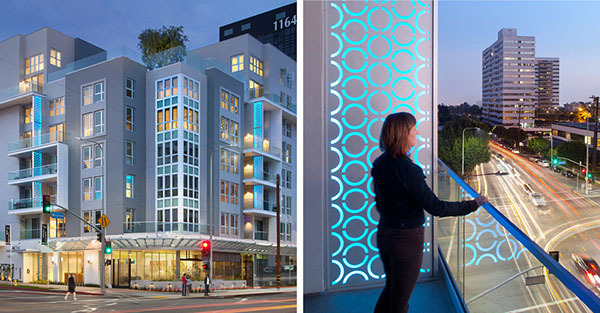 The design can be seen on the custom light boxes that line the interior hallways, on all the signage and way finding, in the graphics along the windows, and in custom exterior water jet cut screens that light the outside of the building.